On the grounds of the famous Stonehurst Manor....INSIDE you will find a fully appointed, luxury condo with two levels and a loft. There are three bedrooms and 2.5 baths. The bedrooms include one with a queen bed and private bath, one with a double bed and one with two twin beds that share the 2nd bath. The large loft area has two twin beds and sitting or game area and there is a half bath off the dining room on the main level. Features include a fully equipped granite kitchen with jennaire glass cook-top and convection oven, fridge and dishwasher, dining room, gas fireplace in large L-shaped living room w/wide screen HD TV and BlueRay DVD, free Wifi, air conditioning, laundry w/new washer and dryer and sliders to two decks (front & back). The condo overlooks the lawn and towering pine trees at the front of the Stonehurst Manor, yet it is privately located and nestled into the adjacent woods. Privacy and convenience form a superior blend with this condominium and its condition is superb. ON THE GROUNDS there is tennis, beautiful viewing spots as well as 45 kilometers of hiking and X-country skiing in Whitaker Woods (access on premises). And, of course, there is the Manor itself where you can enjoy the fireplace in the Library Lounge or relax in fan-backed wicker chairs in one of four intimate dining rooms and savor the delights of their gourmet menu by candlelight. One of our favorites is the fantastic gourmet pizzas prepared in their wood-fired grills, which we like to bring back to the condo. NEARBY are the many natural and man-made attractions and activities of the Mt. Washington Valley. The natural ones surround you at every turn while the man-made pleasures include top-name, tax-free shopping outlets as well as several excellent health clubs, movie theater's and a variety of outstanding restaurants. Upon entering our condo, you will find area maps, area brochures, trail guide books, a mini-library and menus for nearly all the area restaurants. Bed linens and bath towels are provided and we have a cleaning crew that makes certain your reserved time is ready for you and the condo is in perfect condition for your arrival. This condominiom is one of the newest in the Stonehurst Village development and considered by most to be the BEST location of them all. It is simply gorgeous and we serve numerous guests who return year after year after year. 'We had a fantastic time! Your home was welcoming and comfortable which made our stay in New Hampshire very enjoyable. Can't wait to come back!' ...Paul, Ann, Luke, Charlotte & Nancy - Hertfordshire, U.K.
'We had a great time - loved the condo - We will be back!' ...Williamsons from Conn. & Schwartzes from R.I.
'Had a great time - our third year here. See you next year for another peaceful stay.' ...Jay & Roberta, Middleton, R.I. Being in the real estate business, Linda and I were looking for the best location in the North Conway/Mt. Washington Valley area along with the most amenities and privacy. We found all three at Stonehurst Village. An added bonus is the famous Stonehurst Manor which features the fireplaced Library Lounge for cocktails and luxurious dining within walking distance of our condo retreat. The Manor offers great pizzas to go as well! This condo really is the best in the area and the number of guests that return each year and refer us to their friends and families serves as a testimonial to that fact. The Mount Washington valley is one of the most beautiful areas in all of New England. It is a four-season area with activities to suit everyone. Add to that the fine dining and shopping opportunities, as well as nature's tranquility and you have a recipe for enjoyment and serenity. There are hiking and skiing trails at the edge of the property and the Stonehurst Manor is an ideal place for relaxing in the Library Lounge or enjoying some of the finest dining in the area...or both! You can walk to North Conway Village through Whitaker Woods without even seeing a road and enjoy the best coffee and pastries down at The Met Coffeehouse and Art Gallery. toilet, Main living level...with washer and drier. toilet, shower, Bedroom level...Master bedroom bath. toilet, shower, Bedroom level...shared bath for two bedrooms. All three baths (showers, vanities, toilets, fans, walls, floors, lights, mirrors) were updated in 2015. North Conway Village is just 1.5 miles away and features fabulous restaurants, coffee houses and boutique shops. On the grounds of the famous Stonehurst Manor, one of the area's finest restaurants and inn. Views of Mt. Washington and the Moat Mountain range. Cross-country skiing in Whitaker woods. Central air conditioning is provided. ONLY operate by means of the remote control. Sheets, blankets, comforters, towels, pillows. Gas fireplace with brick hearth. Large and open first floor living area with vaulted ceiling and brick hearth gas fireplace (winter months use only). Sliders to two decks with Adirondack chairs and Weber Barbecue. Fully supplied, service for 8+. Gorgeous granite countertops and oak cabinetry. Fully equipped, pots and pans, silverware, dishware, glassware, utensils. The dining room table has self-contained, built-in leaves for expansion from seating for 4 up to seating for 8. Wide screen TVs in living room and master bedroom. AM/FM/ player is provided. Bluetooth enabled. Blu Ray player is provided. There is a bookcase full of books for your reading pleasure. We call it "Linda's Library". Feel free to take and leave a book. A variety of games are available for all age groups. There are a variety of videos available for your viewing pleasure. Loft area with sofas and twin beds and reading area. Try the Saco River. You can rent canoes and kayaks at several local shops. Two decks, main (rear) deck with Adirondack chairs. The best skiing in NH with a half dozen great mountains within close driving range. There is a single tennis court for guests to use. Time must be reserved at the Manor and key picked up there. Loads of excellent golf courses in the area. Simply the Best - Its True ! We had a fantastic time. First off the condo is beautiful and decorated like something in Town & Country magazine yet it felt comfortable and we had no problem lounging on the couch or cooking in the kitchen. 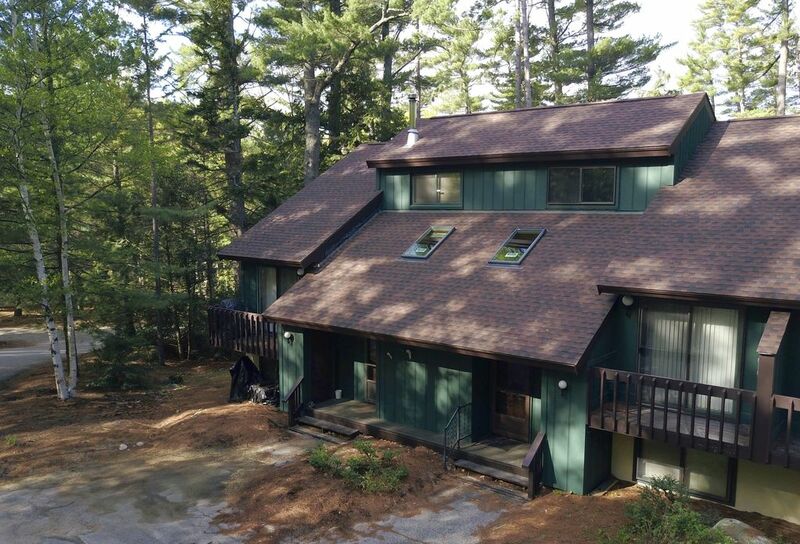 Second the location is perfect two minute drive to North Conway center fifteen minutes to Jackson. Yet you don't have to drive. A two minute walk brings you to the manor where we had drinks and appetizers in the libary one night, and ended up staying for dinner all excellent. The condo itself is very spacious three levels of living space with 3 baths.The deck out front was great for morning coffee or a late night beer! The condo even though close to the manor seemed secluded in the woods and was quiet and peacefull. We loved it ! This was our first time renting thru VRBO and I had a few questions. Jay sent me his number and explained everything and the process was very simple. Jay was a pleasure to deal with and sent me an e-mail the day after our departure saying he had already authorized the return of our security deposit. Jay and Linda's condo is advertised as Simply the Best and our family agrees!! Jay and Linda thanks so much for your hospitality and letting us share your condo.We loved it and can't wait to return.FIVE STARS.The Murphys. Thank you so much for your kind words! We do everything we can to make our guests comfortable and their stay enjoyable. So it is such a pleasure to hear from you confirming that our efforts are being appreciated. We look forward to your return in the future. Who needs a cramped hotel room, when you could stay at this fantastic condo! We have been renting this unit for years and all I can say is FABULOUS!!! Always clean, comfy and perfectly located to all the White Mountain Valley has to offer! We absolutely love this property and highly recommended it to anyone looking to visit the area! Owners are wonderful and so accommodating! Thank you for that wonderful testimonial! We love having you and your family as guests and look forward to your returning in the future. Condo as presented. Lovely secluded area without being isolated. Our family of adults really enjoyed our stay at the Stonehurst condo. It was very clean with plenty of room to relax and spread out. Dinner at the Manor was excellent and proximity to shops and activities was perfect. A great place to stay! Thank you so much, Patricia! We love to walk down and eat at the Stonehurst Manor also. We sincerely hope you and your family will come back again. We had a wonderful visit to the North Conway area. Everything that you want to do in the area is easily accessible from this property. The property is in great shape and well maintained. Especially when visiting the area with children I can't imagine staying at a hotel when you could stay here. Having all the conveniences of home makes everything easier. While there is a swimming pool associated with Stonehurst Manor it is not for use by people staying in the townhouses. There are other great spots for swimming. Echo Lake is nearby, has a beach, lifeguards, picnic tables, warm water and wonderful views – so much better than a pool. We hope to be back in the area again soon and would love to stay here again. Jason...Thank you for your kind and thoughtful review. We, and our cleaning crew, are grateful for how neat and clean you left the condo. You are officially their favorite guests! We look forward to hosting you and your family again in the future. Love the convenience of Stonehurst location with access to amenities you would have at home. We saw a 500 pound bear right outside the front door.. added bonus! Two minor things... 1) would have liked to have a pantry or cabinet space as there was no storage for non perishable items and 2) the cable was challenging to work and went out completely with 2 days remaining. But would not prevent me from coming again. The owners were very responsive to all questions. Thank you for your kind words. Wow...a 500 lb. bear! That must have been something to see. We have seen them ocassionally, but not so much in recent years. Sorry about the cable...We have had "challenges" with Spectrum (the only service provider) in the past and they replaced the modem (again) after you left and that seems to have corrected the issue. We hope we see you again! Holiday Weekends: 3 night minimum and add $50 per night to nightly weekend rate. July & August: 5 night minimum, however there may be shorter stays offered based upon availability. 9% New Hampshire room/sales tax is due with final payment. Damage/Security deposits are returned ASAP (usually 24 hrs. ), no later than 5 days after departure.